First of all, let me just share some exciting news. A few weeks ago I had a card for a free pair of underwear at Victoria's Secret. So off I went. And it happened to be during the 7 for $25 sale, which is a deal I just couldn't pass up. Then they were giving rewards cards with your purchase that have the surprise amount on them until the following month, but all of them are worth at least $10. Well I never thought they ever had any other amount on them. Except yesterday I found my card on the floor of my bedroom almost under the bed. It has $100 on it. I KNOW, RIGHT?!! Where is all this good luck coming from?! Anyways, undergarments aside, this week I worked on my first new pattern, a Leanne Marshall dress [the blue version, not the horrid ruffly/flouncy thing]. I must be getting more patient in my old age because I actually made a muslin of the bodice. I knew I wanted it out of this fabulous Carolina chambray I had, and I didn't want to waste it! Apologies for the absolutely terrible photos in this post, all were taken at night on a cell phone because my camera is dead and I've been doing lots of nighttime sewing. 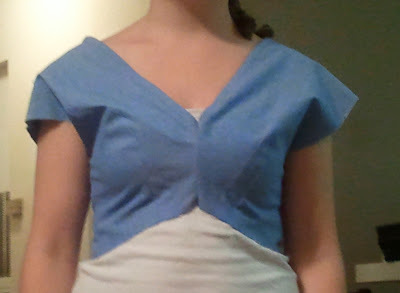 So I made the bodice up the other night in the chambray. Now, this photo is taken at a slight upward angle, so it's a little different perspective from the muslin photo. I did take up the seams and you can see the difference that it made. But I think this went too far, and that I need a fit more in between the two. I also really don't like the sleeves on me, so I might just make it sleeveless. But seriously, look at all those encased seams. Not a raw or zig-zagged edge to be found. It's positively beautiful on the inside. I even tied the bust darts at the end instead of back-stitching so that I wouldn't get pointy bits. I cut out all the pieces for the rest of the dress, and hope to work on it tomorrow! Is anyone making clothes right now too? 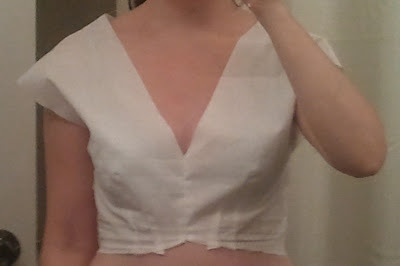 My Mom taught me to adjust the neckline and fit of the shoulder by taking it up across the front and back. (I wish I could just SHOW you! This is going to be hard to describe!). On your pattern, before you cut, fold a horizontal pleat from just above the under-arm seam. 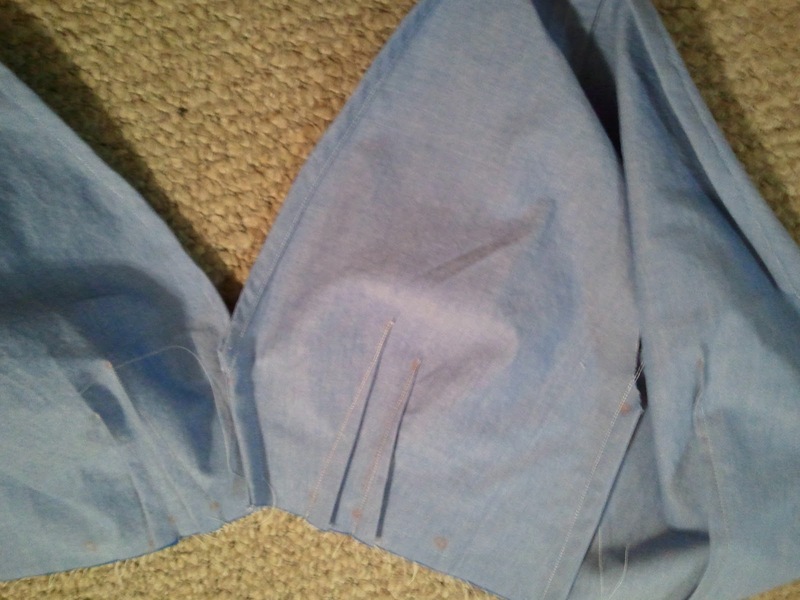 Start where the curve of the arm seam has become almost vertical instead of curvy. Try 1/2 inch or 3/4 inch. It basically makes the pattern that much shorter just above the bust - no need to adjust darts. It always made things fit well. You would also adjust the lining or facing the same way - and a sleeve, if there was one. Just an idea.